It is an abundant time of year. It is a joy to cook in July! 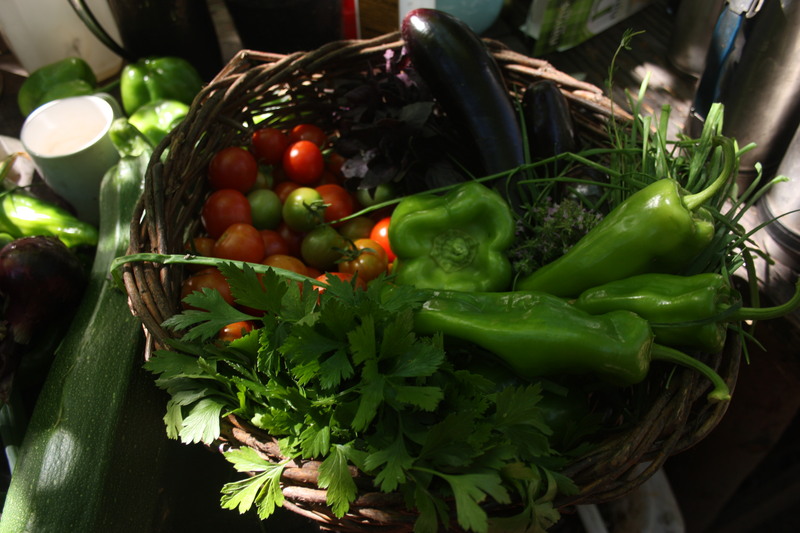 There are so many fresh ingredients to choose from. I wander from garden to poly tunnel with my basket picking courgette, beans, aubergines, peppers, tomatoes, cucumber, basil, rosemary, parsley.Also in season potatoes, carrots, beetroot, kale. I have been making lots of jam this month. Bottled redcurrants, blackcurrants and black currant jam. It is easy to preserve fruit without sugar. You just need to pasteurize it. For example when i make bottled fruit i just put the berries in sterilised jars, pour boiling water over them, close lids and pasteurise in a massive pan of water. You know the jars have sealed when the little disks make a popping sound as the vacuum is created. In my opinion the amount of sugar needed to make proper jam is quite mad and you end up losing the flavour of the fruit. So you can just add sugar to your taste then pasteurise afterwards. The fruit will still keep at least a year from my experience. Although i wouldn’t recommend the sugar free method for rhubarb or gooseberries! Me and Sophia have been seed saving from parsnips, crimson clover and phacelia. The picture above shows parsnip seeds being harvested from the umbels (seed heads). The main umbels (the largest and central)provide the most vigorous seed so we took the seed from these. We also collected seeds from secondary umbels, these will be kept separate as a back up! 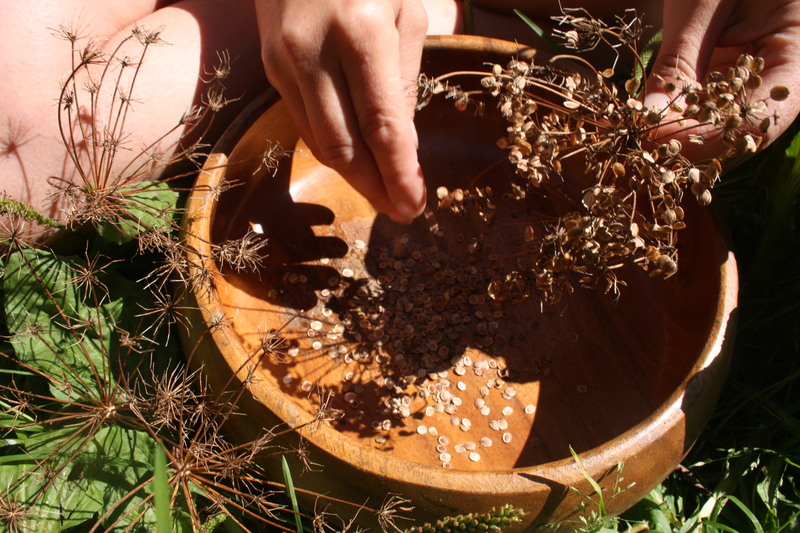 The seeds will be dried further to make sure they keep through the winter. We only need enough for the coming spring as parsnip seeds rarely last more than a year. So we will do the same process again: at least 30 of the biggest and most healthy parsnips are left in the ground. It is best to grow as many as you can for genetic diversity as parsnips are outbreeders. The rest are harvested and eaten in the autumn. 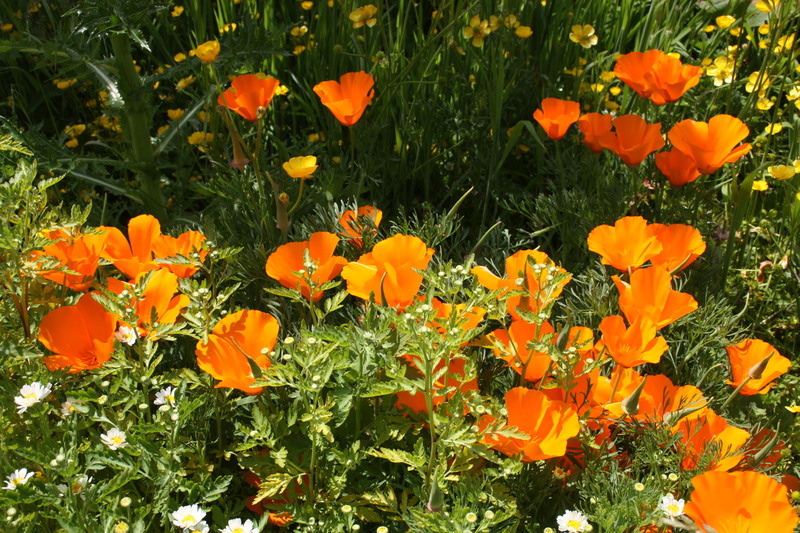 The plants still in the ground are left until the following summer when they send up flower heads which are pollinated by insects. Different varieties of parsnips need to be separated or they are likely to cross. Unless you want to experiment with this! By late July the seeds should be ready. They will be dry and brown on dry brown stems. Harvest during dry weather for nice dry seed. I am pleased with the 125kg potato haul from my small garden. Straight in afterwards is tobacco, another experiment. It is another Solanacae (nightshade family) so it was not so great to put it in after potato. It will only be in a month or so, we should have planted it months ago, but food was obviously a priority. We will see what happens, I understand it is complicated to process, you need somewhere dry to dry it, which can be tricky in England. 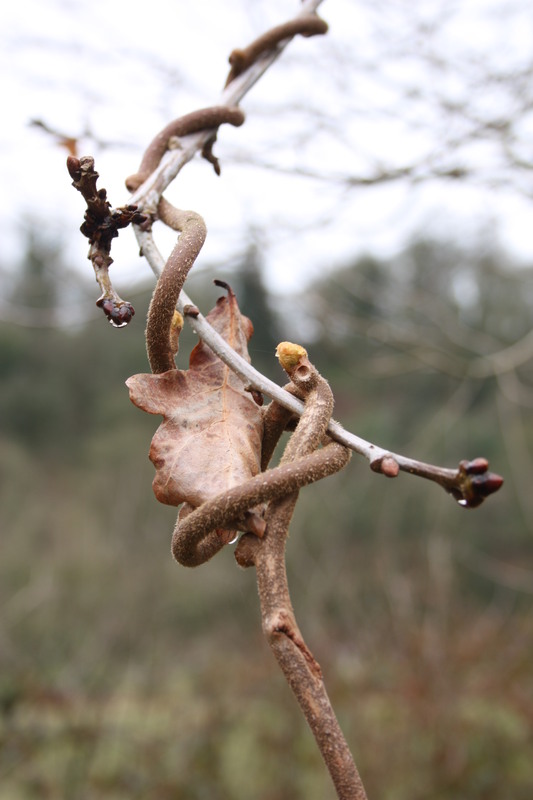 Although this year has been exceptionally dry, at least it has here in the South West. 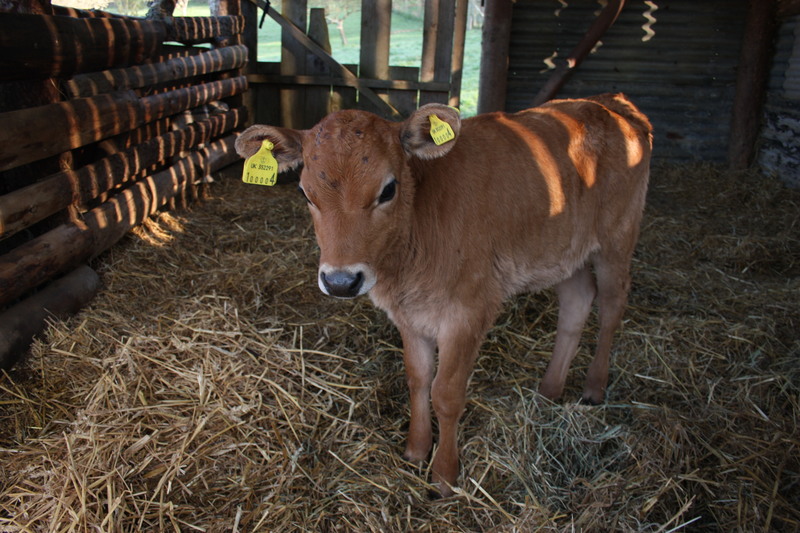 We sadly lost our Dexter calf this month. We don’t know why she died. Poor rhubarb was calling mournfully for a few days. Lady and Luna are happy and healthy. We are getting 10 litres a day on average and still making lots of butter and cheese. Now the calf is weaned there are no more problems with her holding back milk and she willingly walks to the shelter. What a relief after the first couple of months being quite challenging when we were training her to be milked. We did our first sawing with the new band saw and it went really well. There is still some tinkering needed but it was a good day. We have enough boards now to renew the kitchen roof. Woop woop no more drips in the kitchen. It is great to get the horses logging again as they need to be regularly worked and during the summer we are away more and we aren’t always able to work them. 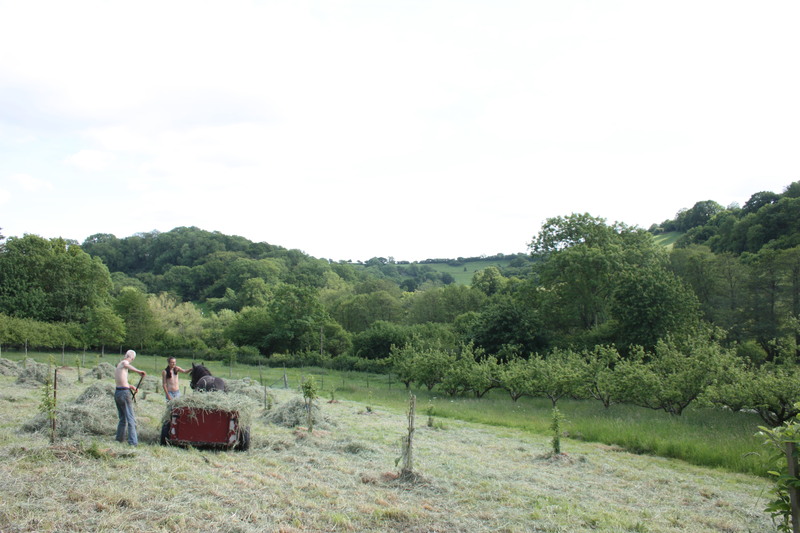 We made our first hay in mid June just before we all went off to the Green Scythe Fair. More about that later. Hay making involves an early start (5am) to beat the heat and to make it easier to cut the grass as it is still damp in the early morning. 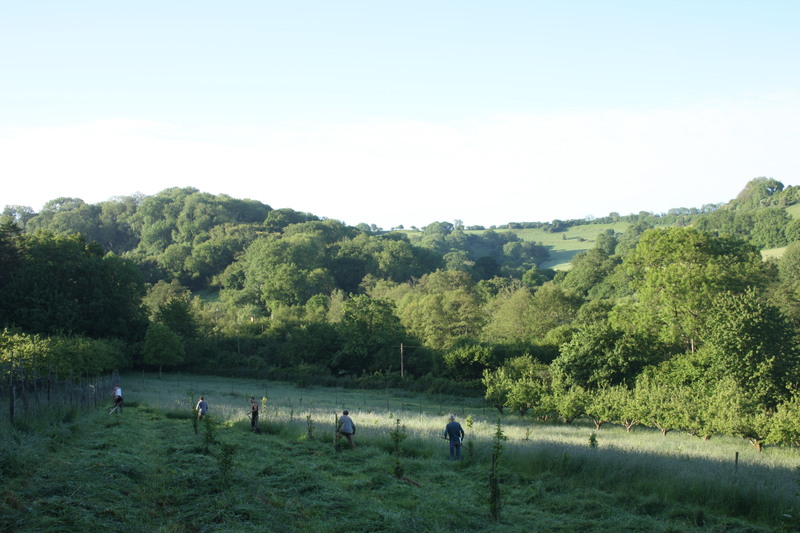 It is beautiful to be in the meadow at this time in the morning as the sun climbs higher in the sky while you work. We cut all our hay by hand with scythes. As you cut a swathe through the grass you leave a row of cut grass on your left. The hay is left to dry until afternoon, then turned. In the evening we come down and pile it into long rows to stop it from getting too damp in the night and the next morning we are down to spread it out to dry, turning it when needed until it is dry enough to store. This meadow alone is not enough to feed our animals through the winter and we will have to cut more hay. We have more mouths to feed now with the two calves, and Jerseys are a bit more high maintenance than the hardy Dexters. Our hay meadow was looking in a lot better shape this year compared to last year though which I was really pleased about. Most of the field isn’t grazed because the animals would damage the young apple trees. This means it has the potential to get very weedy, with a lot of nettles, docks and a few brambles creeping in. 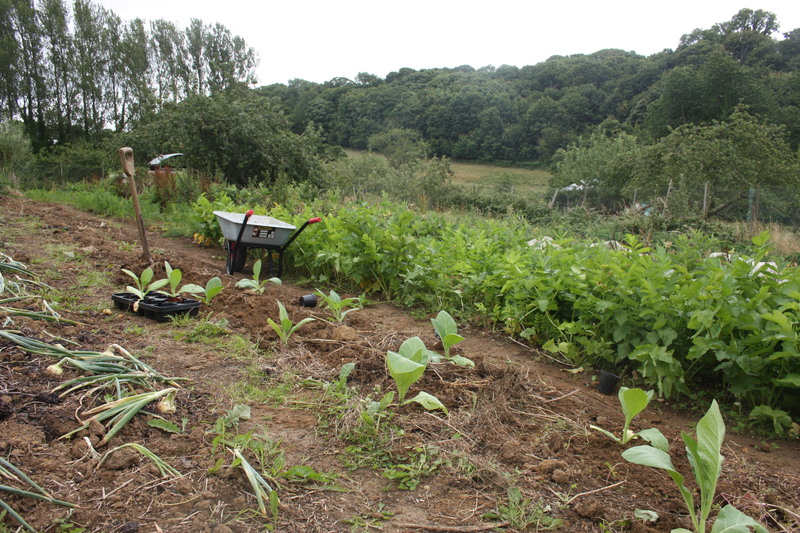 With regular scything of the weeds at the right time we have managed to control them a lot better this year. Tinkers Bubble again had a stall at the Scythe Fair, a one day festival near Langport, Somerset. Both horses were used to take things to the site, as some of us are involved in setting up the festival. Jim took Pedro the 10 miles pulling a cart full of tools, electric fence, tent and bicycle. Once there he was able to help cart things about, much more sensible than a landrover for going back and forth across a field. We sold our apple juice, cakes, plants, baskets and hand carved bowls, spoons and jewellery. We also have info boards with photos of our land and talk to people about why we live on the land and what we are doing. It is great to have feedback from local people about our place in the community. The communual garden is full of a variety of things, some brand new crops are being trialled this year like quinoa, oats and wheat. 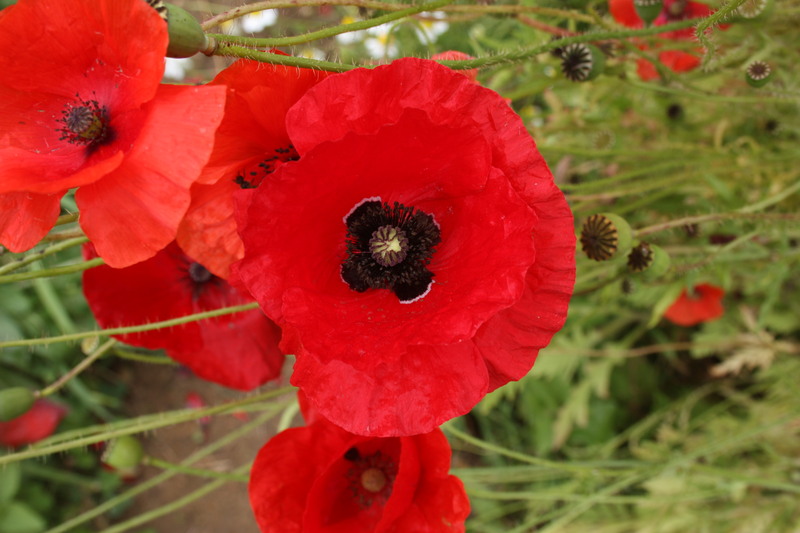 There is a beautiful strip of phacelia with lots of other self seeded flowers like borage, violets and poppies. The bees love it. We have tried to do more of everything that we usually grow. We have a block of 120 sweetcorn plants. Last year they were all stolen by the badgers, just as they were about to be harvested. Better keep an eye on them this year! We are finally eating our own potatoes again and the first courgettes and cucumbers. The strawberries have come and gone. The first gooseberries are ripe, just as we have eaten all the jams and conserves from last year. Oats on their own for breakfast for a short while only! There are lots of herbs and the garlic has been harvested and tied into plaits to hang in the kitchen. We have lots of butter at the moment as we are weaning the calf, Moon from her mothers milk. She is old enough to eat only grass now so we are getting all of Lady’s milk. All the better to make cheeses with. Work continues on the sawmill and it will be ready for a sawing again very soon. It is vital to have it up and running as we are always in need of timber for building, fencing and repairing and of course much of our livelihood comes from selling sawn timber. Sorry, i couldnt help it. So, bit of a slow news month really. 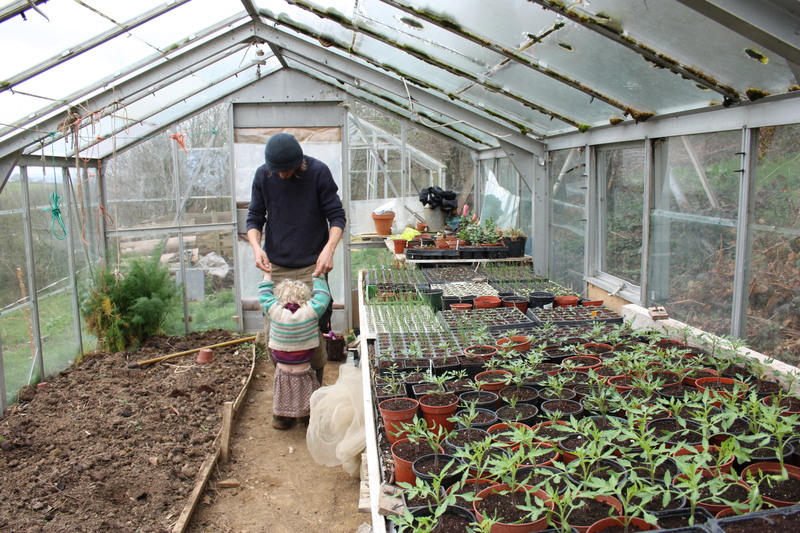 At the beggining of may we were planting out lots of seedlings; squash, brocolli, cabbage. We have quite a few squash left over so we have been squeezing them in all over the place. All the plants in my garden have shot up. 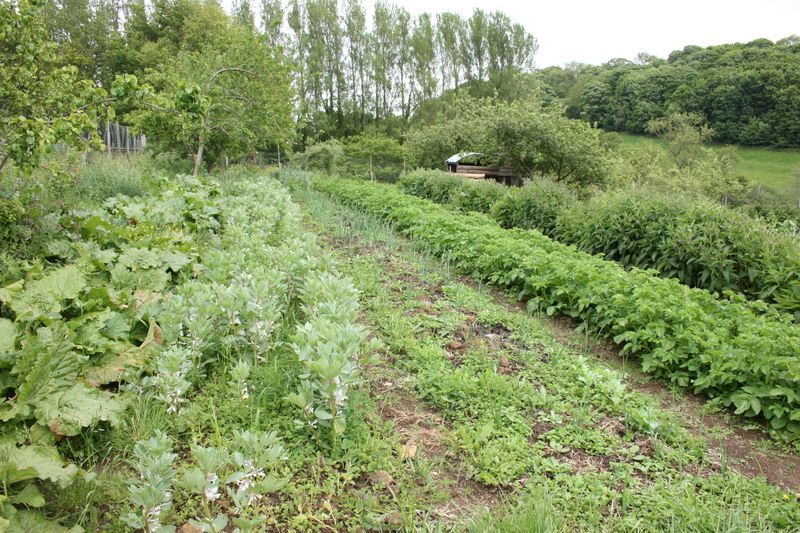 From the left rhubarb, broad beans, onions, potatoes, carrots. There is a healthy row of comfrey which we use for a fertile mulch and make a stinking ‘tea’ to water plants with as it is high in nitrogen and gives plants a boost. The herb garden is looking amazing, flowering chives, rosemary and salad burnett and borage. 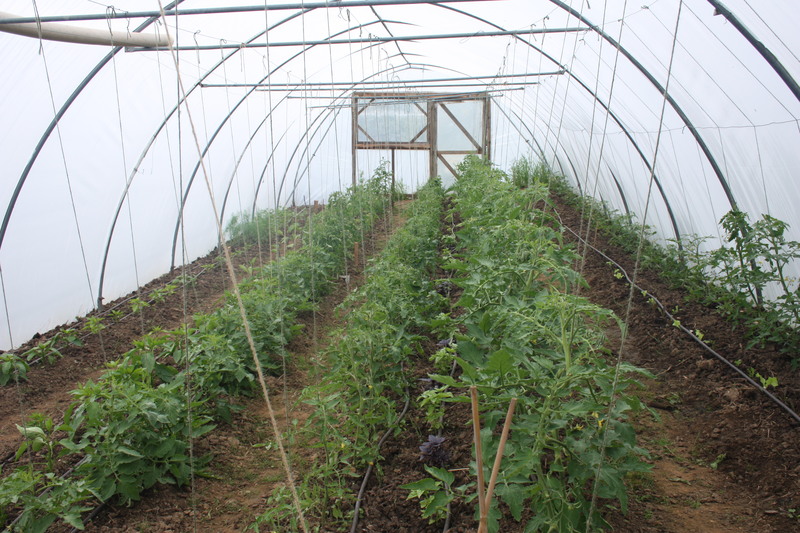 Eds polytunnel, which is mostly tomatoes with basil, coriander, parsley, chilli peppers, aubergines and capsicums. Rhubarb, our dexter cow, had her calf on the 11th of may. The calf is another hiefer and is strong in healthy. We haven’t named her yet, some suggest Snowy (she is black). Please comment if you have a better suggestion! Rhubarb is not the best mum but she is getting better, when the calf was born she was headbutting her when she was trying to feed but recently i have seen her giving her an affectionate lick. Lady is an excellent mum, she was very concerned about the new calf and checked up on her when she was lying under the apple trees. 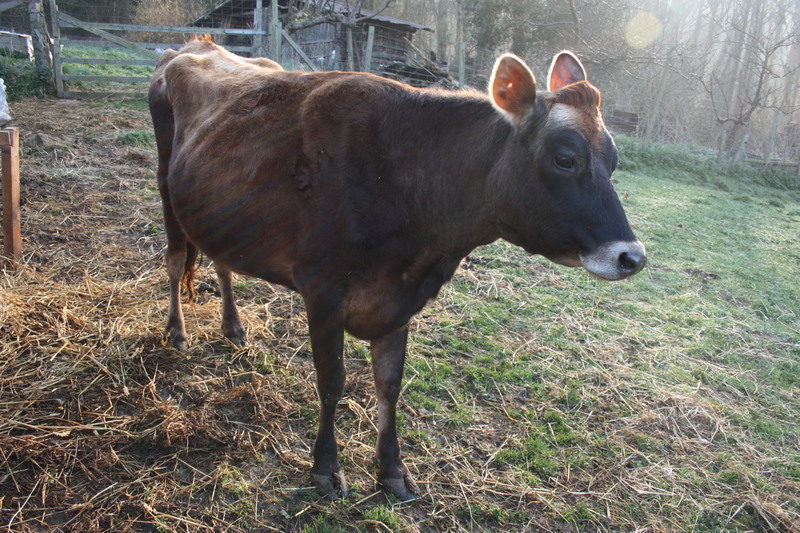 Rhubarb was off stuffing her face with grass postpartum understandably! Regarding the sawmill, we have a new bandsaw but it needs some work to install. For a start it needs to be perpendicular to the steam engine. Annoying, to put it mildly as we have spent the last five years building the new barn to house the sawmill in. 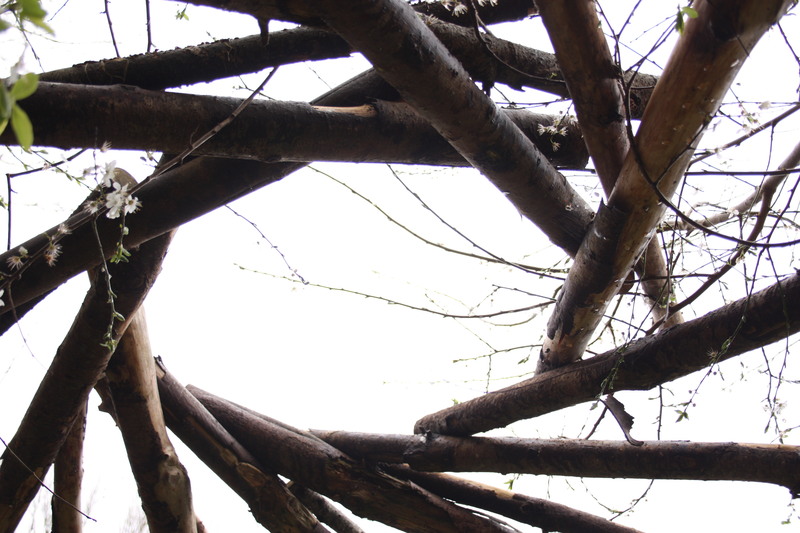 We are going to build a new extension on the barn to house the engine now, but a roundwood frame for obvious reasons. There is some serious tinkering to do. But when it is all ready it should all run more smoothly than before. To excuse the title pun, we have some bumble bee squatters. I noticed a week ago a hole where badgers had gone after the bees nest in the ground and now they have moved in with Ed and Sophia. The strong smell of the lovely laurel flowers drifts through the forest in early April. A big group of us started to cob the outside of the new badger house so dubbed because it now has the old badger house door. 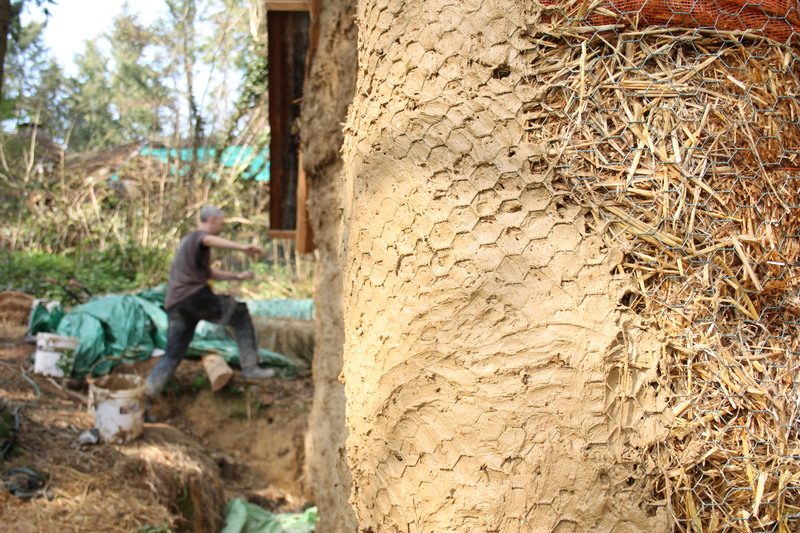 The cob was made with a mixture of sandy soil and lime. Six buckets of sandy sub soil to one of lime. We mix it all up with wellie power in a big tarp. Then it is smoothed out over the walls. We did two layers during April. 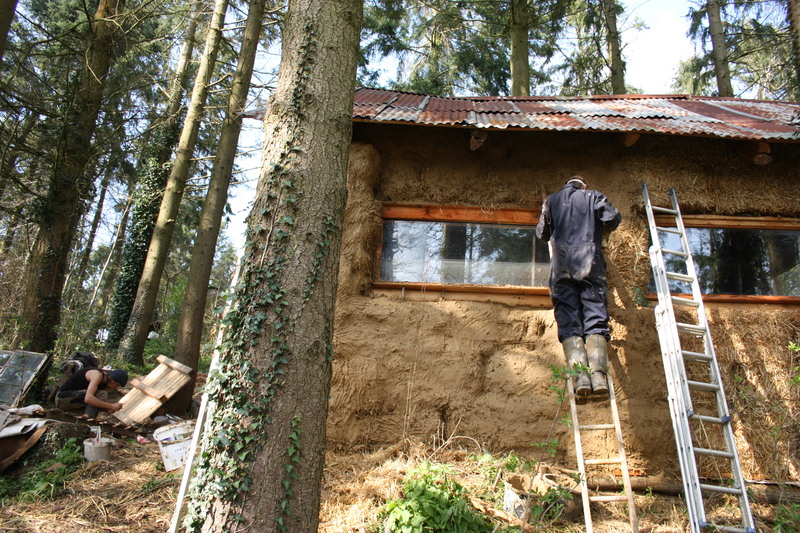 The lime is added to make it easier to apply the mix and help to weatherproof it. Some parts of the wall needed a bit of chickenwire to give it integrity, there can be cracks between the bales or gaps under the eaves. These get stuffed with straw, the chicken wire goes over the top, held in with long staples made of metal fencing wire. The cob is smoothed over and you would never know. The walls cracked quite a lot in april as we had virtually no rain. They have been hosed down a few times which stops them drying out to quickly and cracking. In other news, we took down the old badger house, which was a big old ‘slug’ bender hybrid. It was about 15 years old or so I think. 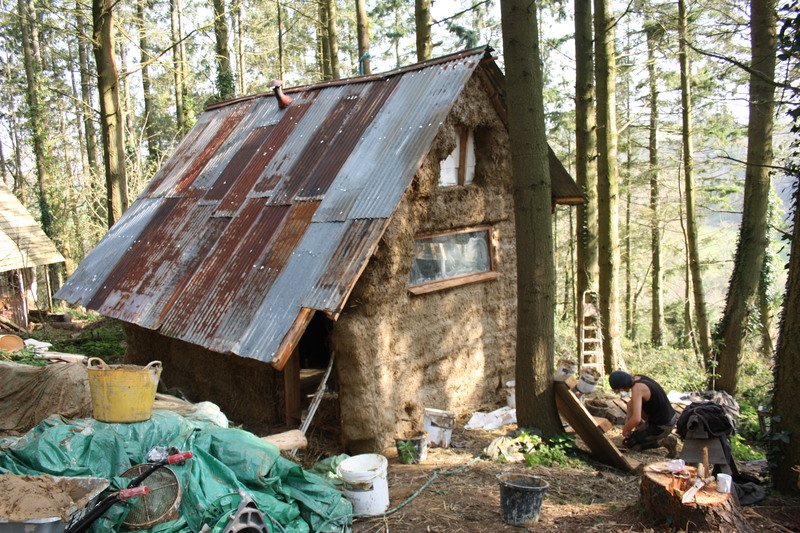 It had cob walls in some places, pallets with bottles and cob, big recycled windows and a bender roof of bend hazel and hornbeam branches. We spent a day dismanteling it together. The bottles were all taken down the hill to be recycled. The wood will be burnt in the steam engine and rayburn, some of the straw is good enough to use for mulch. Windows were taken down to be used in the barn and any new structures. 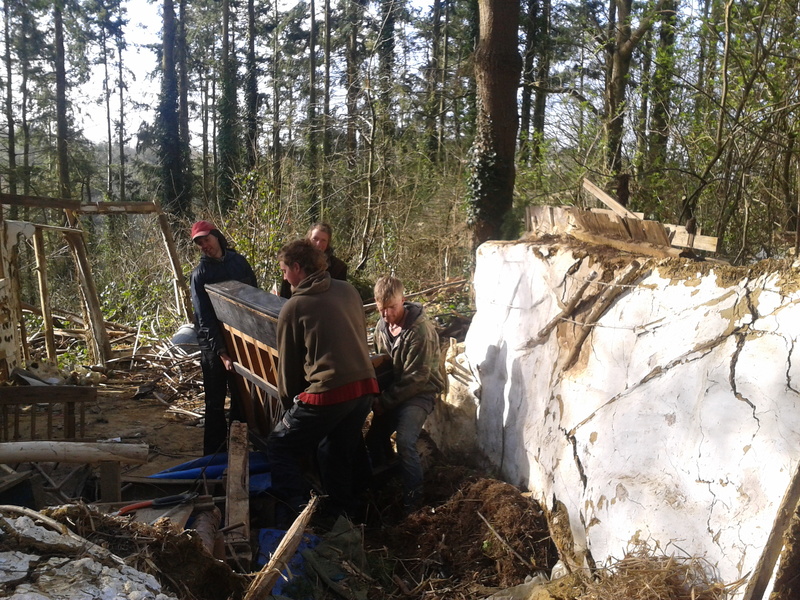 And the piano… is in the new badger house. The site now is just a flat piece of land with a tidy stack of straw bales. All the materials were organic (or recyclable). A beautiful demolition. 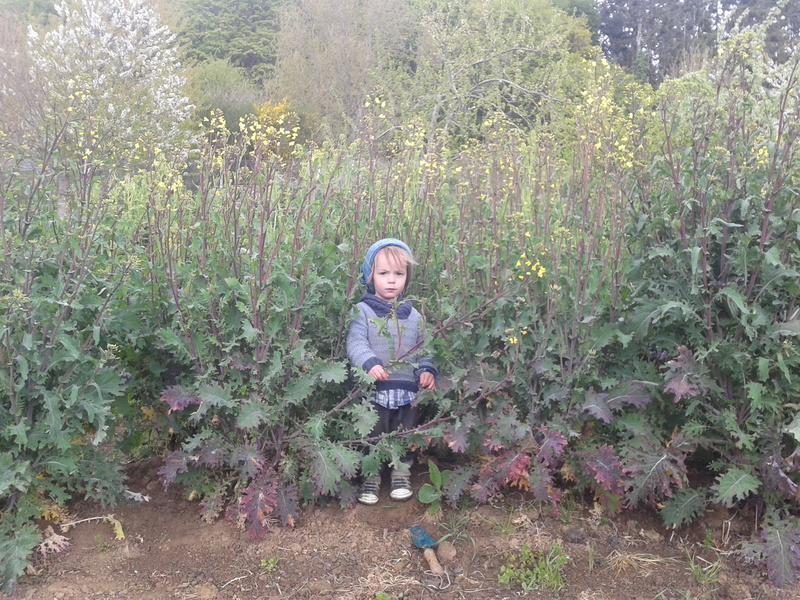 Food wise, april was a month of leeks, kale and yes! purple sprouting brocolli which is such a treat when it is first ready but then we ate it every day for a month. We are still eating bought in potatoes at the moment to supplement our brassica based diet. We unearthed some stray carrots too, tiny ones that are a pain to wash. That was a treat.We did have a couple of cauliflowers and a few calabrese. We have got lots of milk and some hard cheese so lots of leek and potato bakes and leeks with mashed potato and roast potato with cheesy leek bake, leek and potato soup with kale… Supplemented with nettles and the first salads, sorrel, chives and tons of wild garlic. I planted out quite a few things in my new beds, asters, dahlias, poppies and a little wildflower patch of seeds that i have saved from hedgerows whilst walking and hitchhiking around in Devon. I miss the meadowsweet and blue alkanet which grew everywhere where i lived before. I also did a resowing of my carrots in places where they were looking thin. The wonderful thing about having a dry spring is that there have been virtually no slugs or weeds. But we have had to water our seedlings as there was almost no rain at all. So many beautiful wild flowers coming out, red campion, white dead nettle, ground ivy, winter purslane, herb robert, cow parsley, wild comfrey, lungwort, phacelia, borage, blueberry, currants, gooseberries, rocket, kale, chives,unfurling ferns, buttercups, daisies. And of course, the apple blossom. Here is hoping for an abundant apple harvest this year. March has been the super milky month. Ladys calf luna was born on the fifth of on the full moon hence the new age name. We stood outside the cow shelter like kids excitedly peeking at the calf and giggling at her cuteness whilst trying to be quiet and not disturb the new mother and baby. After a week of the calf taking all the milk we started to milk the cow. We started off only taking a small amount of milk so the calf could have most of it but now a few weeks on we are getting about six litres a day and milking her out to increase production. We have started making butter and cheese and having lots of white sauce potato bakes and putting whey in everything. The evening milk (which is more creamy) is poured in a cream separator which is just a massive kilner jar with a tap. The milk is used for cheese making and the cream is used for butter making. To make butter all the cream is poured into a butter churn which is a another big jar with a handle on top which turns wooden paddles that churn the cream into butter. Sometimes it is quite quick and sometimes it takes 45 minutes. You churn it for ages then there is suddenly a golden lump of butter in there. There is also some buttermilk left over. So you sieve the butter and squish it with the scotch hands (to get all the liquid out)which are wooden paddle things which have grooves on one side. Then you can roll it into a round or squidge it into a brick. The first cheese i made was a simple cottage cheese. This is very easy to make. I used milk that had had the cream separated. I added a few drops of rennet and left the milk in the hay box with a hot water bottle over night. The next day i heated it on the stove until it curdled. This is when the curds (used to make cheese) separate from the whey. The curds look like white lumpy bits that gradually all stick together. When I thought it had separated as much as it was going to I took it off the heat and strained off the whey which is kept for cooking. Traditionally it would be given to pigs to help fatten them up. So then i just added some salt and chopped chives and you have an easy soft cheese. 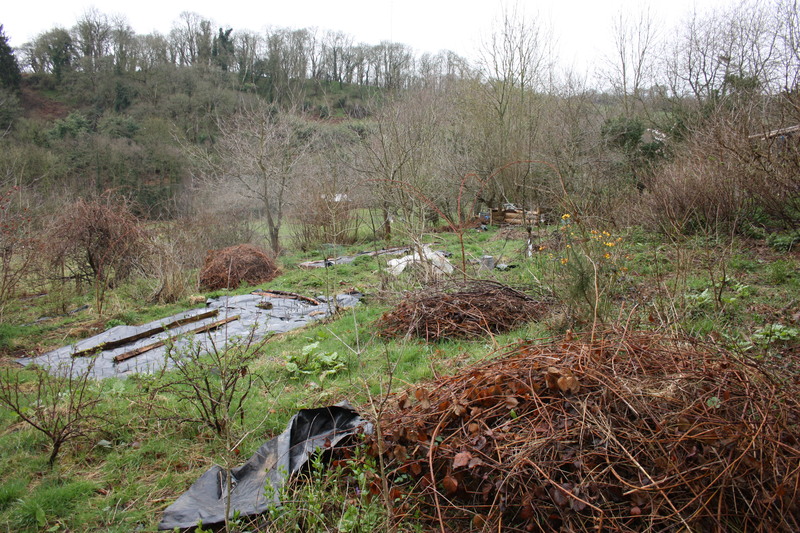 During the forestry weekend in March we did some more felling in the area we are clearing next to the communual garden and also some tidying up here around our houses. Some trees are a cause for concern if they have a large crack inthe trunk and are right next to someones house for example. Fortunately there was only one casualty…a wheelbarrow. He was in the wrong place at the wrong time and will be sorely missed. In the garden this month we are mostly eating leeks and kale. We have had to buy in potatoes as we had a bad harvest last year. So lots of leeka dn potato soup and leek and potato bake with the occasional rabbit thrown in. We are eating the last of the parsnips now and the purple sprouting broccolli is just starting to come through. Winter purslane is a great wild green to put in salads and it grows in profusion up in the woods around our houses. 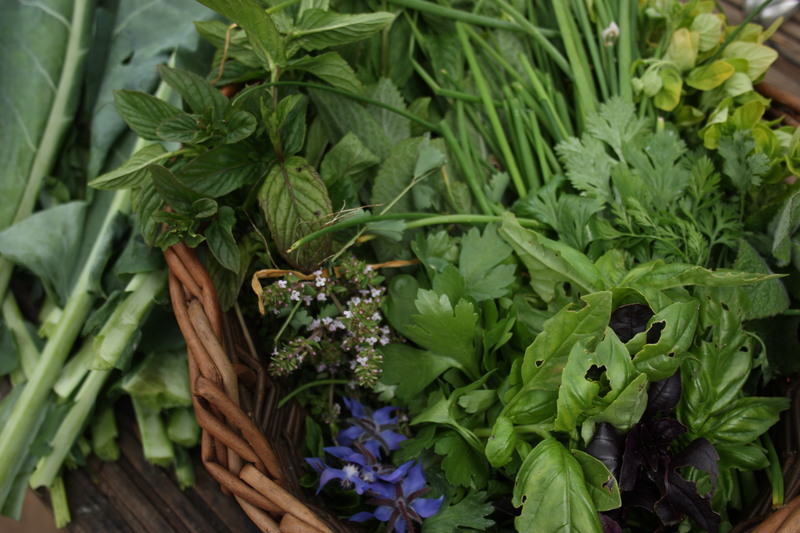 We also have rocket, chard, spinach, sorrel, parsley to add into salads. The plum and sloe blossom is starting to come out and is a beautiful welcome into the warmer part of the year. Daffodills and primroses have sprung up all over the woods and the yellow celandine is everywhere too. I have seen the first red campion and the birds seem to be singing their more upbeat spring songs. Sophia and I have been tidying an abandoned garden which got pretty overgrown as no one has been working in there for a couple of years. 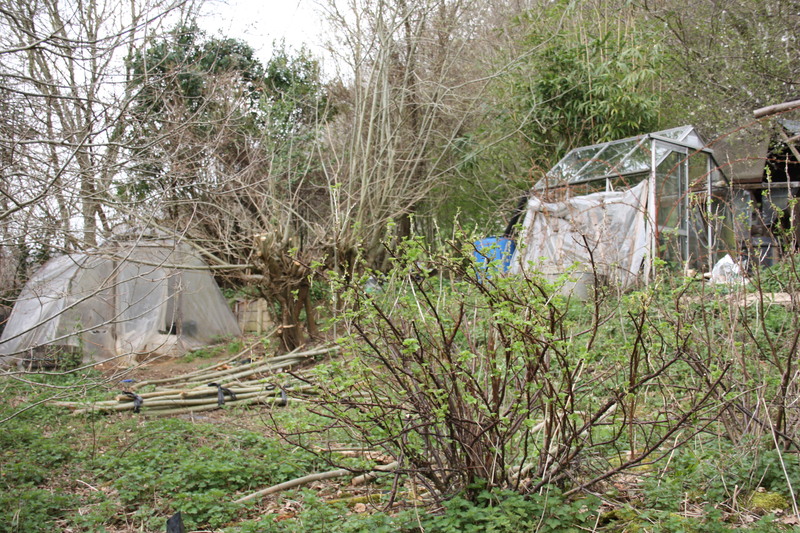 Earlier this year we scythed the brambles and nettles and discovered that it is full of fruit bushes. Gooseberries and blackcurrants, also a fig, a kiwi, a mulberry, a japanese wineberry. Sophia has planted willow in there for her basketry and a bed with some salads. We are going to continue rennovating the wild garden when we get the time, but in a way it is nice to have a garden that is a bit mad and does its own thing. It is full of self seeded rhubarb and garlic and comfrey and hazel and oak and some bamboo someone planted and lots of fruit trees. 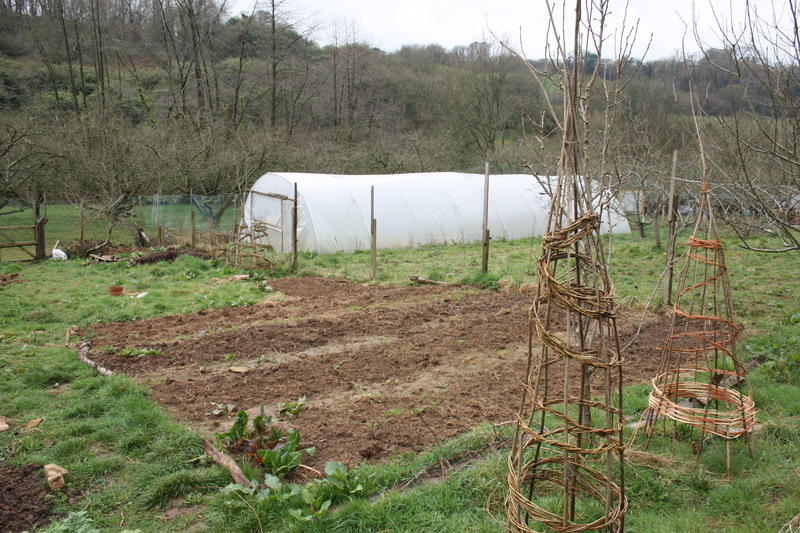 I have dug some new beds in my garden with the help of the lovely wwoofers as always. This year I am growing some flowers in addition to all the vegetables (potatoes, carrots, onions and broad beans) and I am very excited about growing woad to use for dying. Woad is a plant from the brassica family (cabbages) and produces a beautiful blue dye from its leaves. It was thought that the celts used it as a body paint but this now seems unlikely. It does dye cloth though and although it isnt native has been used in this country for thousands of years. I am sure when i harvest it the temptation to paint my self blue and run naked up to the valley to the hillfort will be overwhelming.